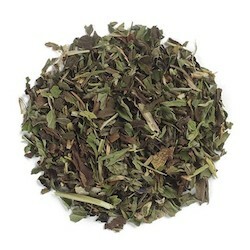 Organic, aromatic, top-quality peppermint leaf. Peppermint is a hybrid of watermint and spearmint. Indigenous to Europe, it is now widely cultivated throughout the world. Sometimes referred to as "the world's oldest medicine," peppermint has been used for centuries to settle upset stomach and freshen breath. Aromatic Peppermint Leaf is commonly used for teas, herbal body care and crafts. Sourced from Well Earth farmers in Oregon and Washington. Directions: To prepare as a tea, pour 8 ounces boiling water over 1 to 2 teaspoons of herb. Cover and steep for 5 to 10 minutes, strain and serve immediately.